Back by popular demand! We’ll have several stress less events during finals week. 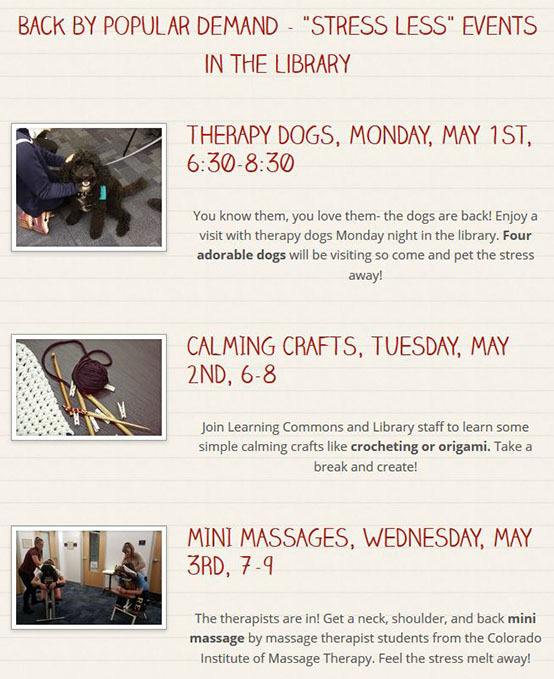 Don’t forget to check out our stress less activities during the week! Lois Beebe Hayna died on Monday, April 10th at the age of 103. Born in Vesper, WI in 1913, she won a scholarship (during the Depression) to the University of Wisconsin. She graduated, married and raised 3 children. For 30 years “I wrote nothing,” she recalled. In 1974, she started teaching poetry, before she stopped teaching the class and joined it, transforming the meetings to a critique group for inspiring each other’s work. She never looked back, writing essays and poetry up to 2017. In tribute, the Lois Beebe Hayna Writing Center in the Dayton Memorial Library honors her published works, as well as providing space for reading, writing, and poetry classes. The Regis University Archives and Special Collections holds the revisions and manuscript drafts of her approximately 43 years of writing: essays about rural life, the Depression, the war effort, short stories, a play, and over 3,000 poems depicting love, hate, death, age and the human condition. The Dayton Memorial Library will be closed on Friday, April 14th and Sunday, April 16th. We will have regular hours on Saturday, April 15th, 9:00 a.m. – 6:00 p.m.
National Library Week is April 9th – 15th! Join us in celebrating libraries by attending the Library Fair on Wednesday, April 12th from 11:00 a.m. – 1:00 p.m. We’ll have information booths outside in front of the library, as well as food and giveaways. Come inside and see the coordinating exhibit in the fireplace lounge, presenting art and artifacts from libraries as well as a gallery of READ posters. You are currently browsing the Regis University Library news blog archives for April, 2017.